If a tree falls in the woods, can you hear it? If it falls on your house you can! 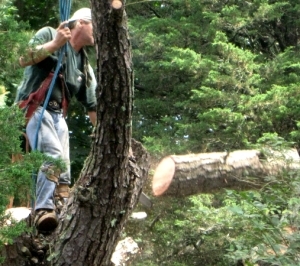 We remove hazardous trees before they damage your home, property, or other trees. Safe tree removal takes skill. Most trees cannot just be felled in a yard because they extend over your home, shrubs, landscaping, pool or even your neighbor’s property. Our team of expert climbers have years of experience in dealing with all types of difficult situations such as limited access areas, near by utility lines, and trees with extreme decay. A to Z trees is fully insured and posesses the right equipment for the job so you can rest easy.